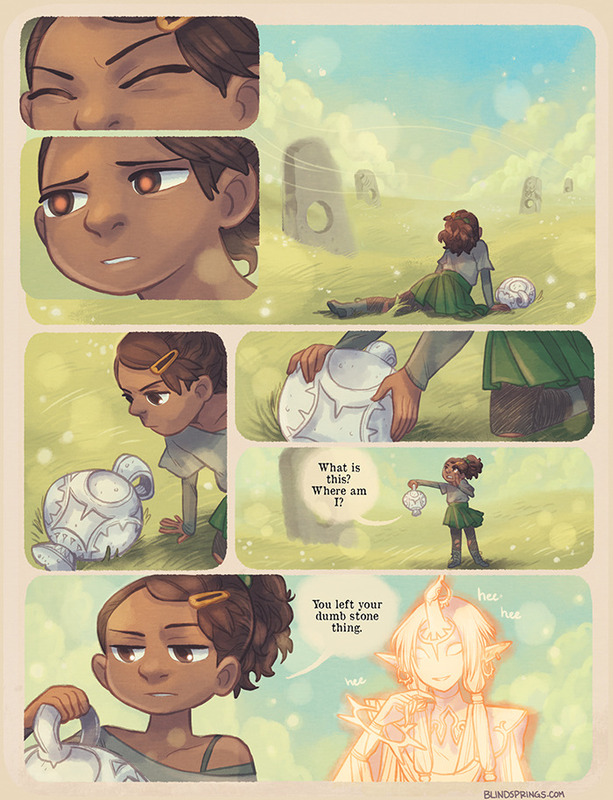 Blindsprings is a webcomic that updates two times weekly, Tuesdays and Thursdays; it features a princess named Tamaura who made a contract with ancient spirits to serve them in order to protect her sister. When a rogue mage pulls her from her woods and breaks her contract, she finds that it has been 300 years since she last saw the outside world. One of the things that separates good web comics from mediocre or bad web comics is preplanning. I started reading webcomics in the early 00s, and while that wasn’t the bleeding edge, there was still a lot more chaff at that point than there is now. Part of why webcomics are consistently better now is that instead of building a comic around a few characters and a daily joke, webcomics creators are coming into a comic with a plan. 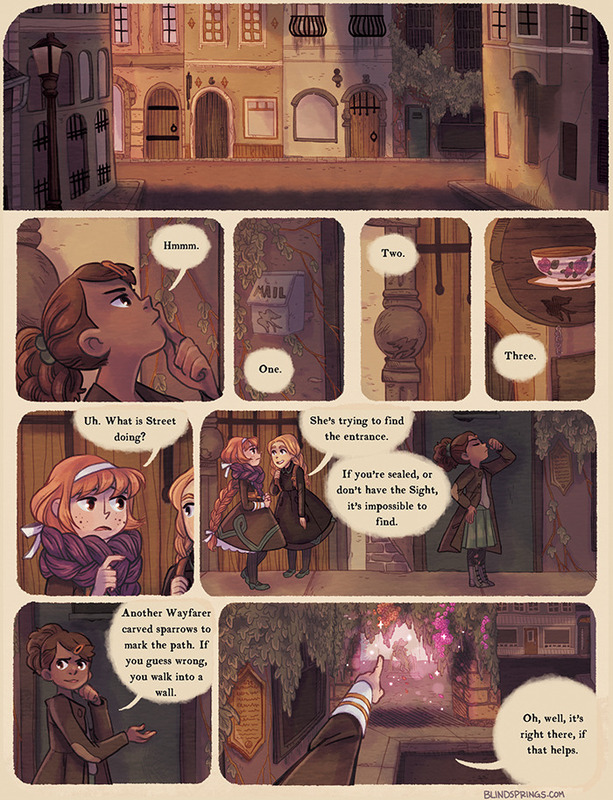 Blindsprings is clearly a webcomic with a plan. 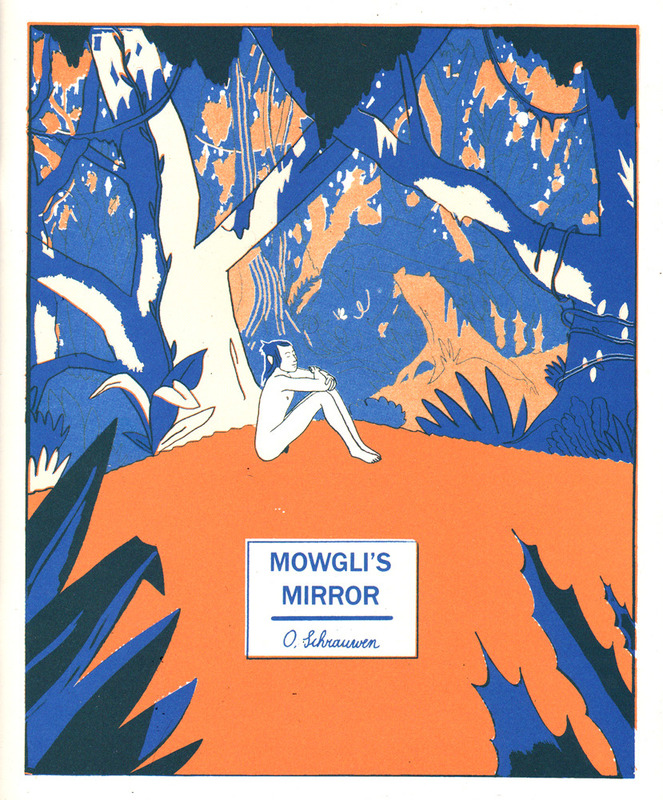 There are a lot of features of the comic that are still a little hazy – like what exactly is an Orphic witch, why are Orphics segregated/discriminated against, how does Tamaura’s contract interact with this new world, etc. The biggest key here is that Fedoruk is (or at least appears to be) plotting comics ahead of time. It also doesn’t hurt that Blindsprings is absolutely stunning in terms of both palette and style. The colors and lines are soft but distinct. Take a look at the pages I’ve pulled for a better look, but it’s clear that these pages are taking a lot of time. One thing that I really enjoy about Blindsprings is the way Fedoruk resists the temptation to pit the forces of the book against each other. There isn’t really a “good side” at this point – the spirits aren’t exactly kind and gentle protectors, and the Academic Mages have created a society that discriminates against Orphics. The people caught up in the middle are trying to make things work, maybe well, maybe not. Of note, I do have some concerns with Blindspring’s pacing on a macro level. 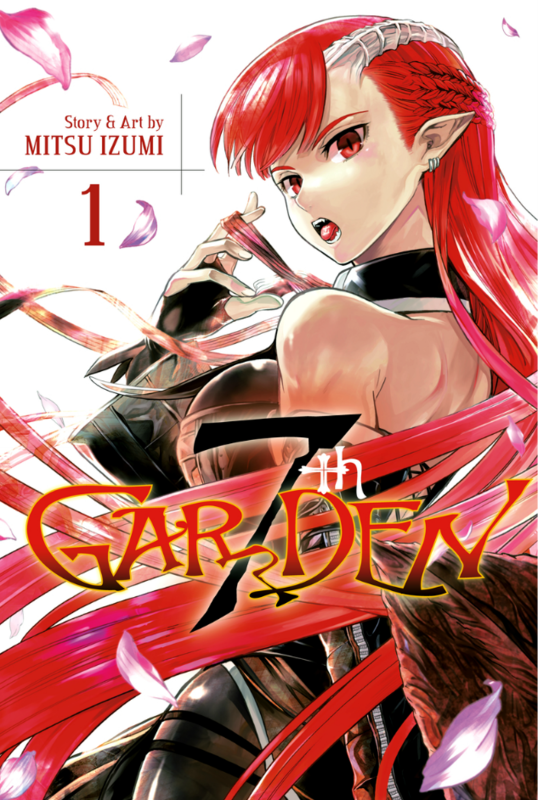 Each page flows very well, but the story seems to be moving rather quickly and without much in the way of explanation. Certainly part of this is on purpose, but I think there is something to be said for a slower burn and for allowing characters to grow on the page. We’re at a big turning point in the second chapter which may prove that my concerns are unfounded, but, as always, there will be more to come. Clocking in thus far at just over 70 pages, Blindsprings is a fairly quick comic to jump into, and I think it’s a good example of how a webcomic can work well. Above all, I’m hoping for some answers in the upcoming weeks – let’s hope that they’re as good as the questions that have been posed thusfar. 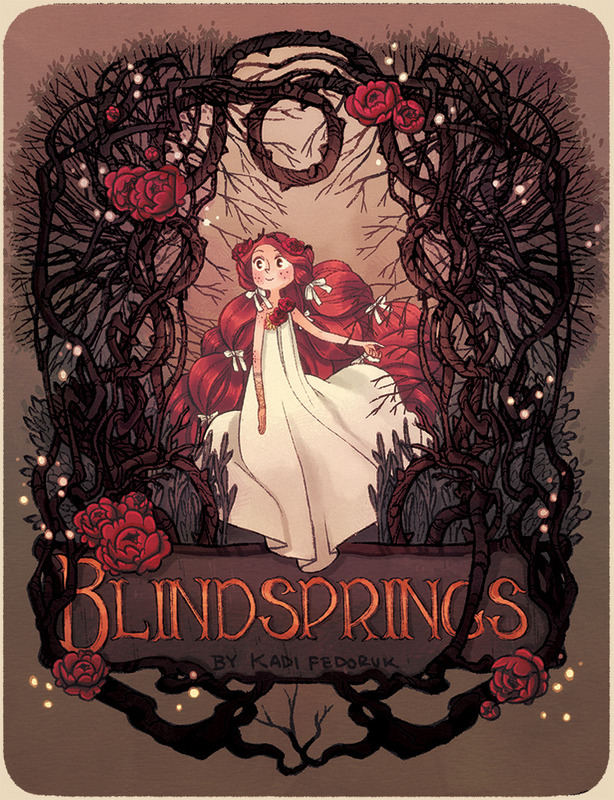 Blindsprings can be found at Blindsprings.com, and is written by Kadi Fedoruk, who can be found at blindsprings and on twitter at @KadiFedoruk.